This studio ( Studio 1 ) benefits from a double walk in shower, a separate kitchen door, double doors to the terrace featuring a relaxing 'Sunset ' bench. These fully refurbished (2017) studios are finished to the highest standard of style and comfort with air conditioning, luxury kingsize double beds with top quality mattresses,sleek modern kitchenette and separate bathroom. We booked for mid-October and it was the end of the season, so things were quiet and just beginning to close down in Assos and other parts of the island; but that suited us as it was really lovely and quiet. Everyone said it had been really busy, so if you have a choice then go for before or after the school holiday. the studio is really cute, nicely decorated and upkeep really good. It has a proper sized fridge, air-con and 2 ring hob and a TV, which is only good for DVDs unless you speak Greek. Steve and Dot were welcoming and helpful. We drove around and visited some great beaches, the monastery and other towns; it is a beautiful island; and coming back to lovely Assos was great. There are 3 tavernas and 1 beach-side snack place. We found 2 of the tavernas to be great. All this is just 3 minutes walk away. The veranda outside studio 1 is great. My only suggestion would be to have mossie screens on the windows as we got badly bitten. Many thanks for your comments Justine, they are much appreciated. Having travelled around much of the island the north is definitely the best part and Assos is the most beautiful location there. We were expecting the apartment to be perfect for us having gone through all the photos and read all the reviews so it was no surprise that it was! It was a surprise to find that we had an excellent view of Assos from the balcony though as the photos didn’t really show that well. The highlight of our stay was hiring a boat and touring the most amazing isolated bays and beaches for the day. Steve and Dot will be able to recommend a reputable company based in Fiskardo. Don’t be tempted to pay extra for a higher powered boat though as we did – we’d have chipped our teeth if we’d got it up to full speed! Thanks Gareth we are so glad you enjoyed it. Steve & Dot have worked wonders on their Katafygio studio apartments in Assos. The decor is tasteful and welcoming. They seem to have thought of everything. The bed was EXTRA comfy and we enjoyed a good night's sleep every night. We were welcomed with a bottle of local wine, milk, tea, coffee, bottled water and biscuits to ensure that we could relax for a while before having to pop to the local shop (which is only 1 minute's walk away). The local tavernas and beach are also only a couple of minutes walk from the studios. Assos itself is a most beautiful haven which remains largely unspoilt and has changed little in the last 10 years. If your thinking of visiting Kefalonia, make sure you stay in Assos and we would highly recommend Katafygio. Thanks Jonathan - our extra comfy beds are really proving a big hit with our guests. Glad you enjoyed yourselves, you and Margaret are welcome back any time. The apartment was well appointed, very clean and welcoming. The location is ideal as it allows you sit and read quietly beneath the bougainvillea, or wander down the short distance to the harbour front to a selection of consistently good places to eat and drink, as well as swimming from the beach in the safe, clean, turquoise sea. Steve and Dot are charming, informative but unobtrusive hosts, who do their best to make sure that your stay is memorable. Ours certainly was, and we would definitely recommend the apartments to friends and family. Thank you. We are so pleased you and Mark had a good holiday - and made some new friends along the way. You're all welcome back any time. A little slice of Mama Mia! Luxuriously comfortable, spotlessly clean, wonderful breakfasts on the terrace looking out to the bay and the magnificent backdrop of the mountains - breathtaking. Wonderful hosts, nothing too much trouble for Dot and Steve. Assos is the real hidden gem of Kefalonia, recommend dining at Planatos for local specialities - the goat stew was fab! Fish everywhere is delicious, would highly recommend Katafygio to anyone - we have already booked to return next year! What can we say? 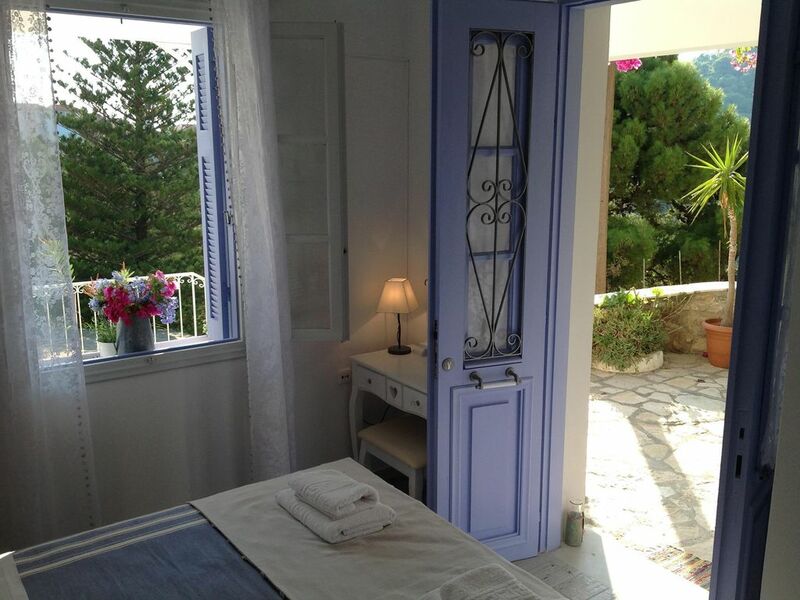 re-booked for next year before you even left Kefalonia! Thank you so much and Dot and I look forward to seeing you next year. Well appointed. Home away from home. Perfect situation over looking beautiful Assos with charming hosts. A little gem! Whilst Assos is a serene, quiet little hideaway we have found a choice of almost deserted beaches all within 30 minutes drive. Our personal favourites are Kiriakis and Vouti - magical!